It’s been a few days since we looked at whether the fractal is still alive or not. I suspect it, and the analog between 2007/8 and 2011, simply became too well known. TPTB have very strong vested interest in keeping this crap game afloat, and a July style plunge would be very bad for biz. I have to accept some of the blame. Hoping to share the benefit of my discovery, I probably spread the word a little too wide. I believe I was one of only a handful who saw it coming in July; but, this time around, there were no doubt many, many more. I’ve seen a huge uptick in the traffic to the site, and many of my charts are ending up on other technical websites — with and without attribution. I’m considering changing pebblewriter to a member-only site, charging a nominal fee and posting all my short-term and longer-term harmonic set ups, along with a guide to understanding harmonics. I have a few institutional clients for whom I consult, and I know they would appreciate a tighter circle. Please drop me a line, let me know what you think. I can be reached at pebblescribe at gmail dot com. Things were looking pretty good up until about marker #8 on the current (right hand side) chart. In July, #8 couldn’t push up past #6. To some of the Ellioticians I follow, this was a truncated C wave. the ABC also expanded. Currently, we’ve completed a more traditional zig-zag pattern where C exceeds A in price and is almost equal in length to A. Rather than expanding, prices have narrowed — forming a rising wedge. Obviously, time and price comparisons for the fractal have both suffered. It doesn’t invalidate the fact that we’ve formed a robust rising wedge with growing negative divergence and half a dozen other signs of a top. It remains to be seen whether we’ll see the same payoff as the Feb-Jul time period; my best guess is that we will. Regarding the analog between 2007/8 and 2011 that worked so well up until the spike around day 125, it’s also off track. Again, the culprit is the day 125 spike — as well as the size of the corrective wave in July. 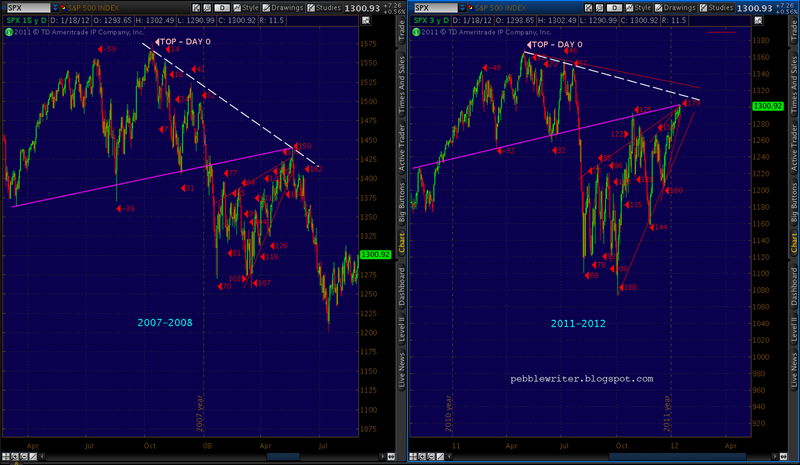 A trend line drawn off the Oct 2007 top through the Dec highs provided great guidance for the May (day 150) Wave 2 peak. But, because July was higher, the trend line off the top was tilted upward relative to 2008. As we’ve discussed before, it ranges from 1303 to 1329, depending on whether one counts shadows or not. 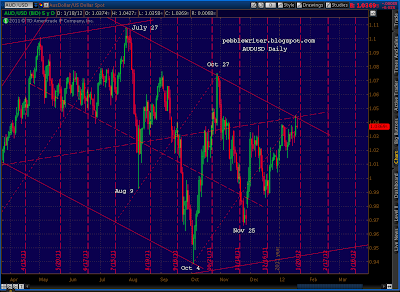 So, although we’re off track in terms of the day count, we’re still very much on track in terms of the chart pattern. Throw in all the other indicators (the third rail, negative divergence, narrowing leadership, negative divergence both on technical terms and relative to VIX, XLF, RUT, etc.) and I’d say the upside is very, very limited. I suspect that, years from now, we’ll look back at the obvious similarities and forget all about the several weeks of divergence between the two. VIX, which broke out of the smaller falling wedge (dashed, white) we’ve been tracking for the past month or so, smacked up against the upper boundary of the larger falling wedge (solid, red). 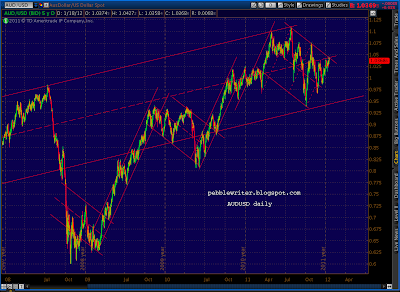 It also works as a back test of the smaller wedge trend line. I suspect that the Bat pattern we just completed at the .886 on the 60-min chart will constitute a Point B for a larger Crab pattern that breaks VIX out of the larger wedge, too. If so, look for a completion of the inverse H&S; pattern that’s setting up — with potential to 28-29. 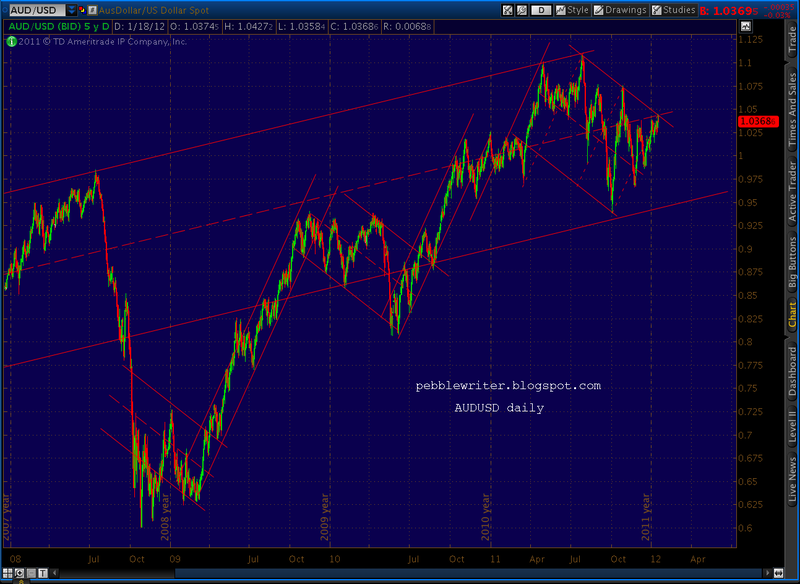 AUDUSD has been a great indicator for the direction of the stock market. Currently, it’s saying we’re on a precipice, but there’s likely a little more juice left in the market before the downturn gains momentum. 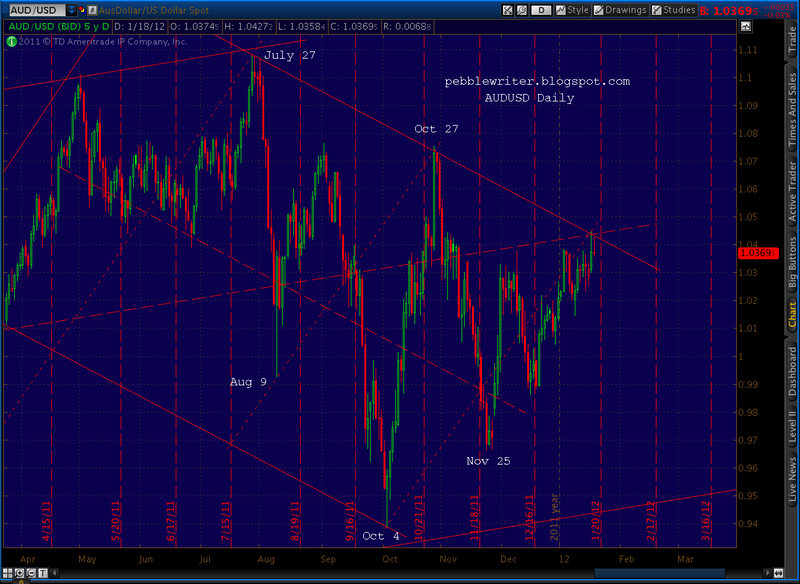 The AUDUSD patterns have followed some pretty clearly discernible paths. In general, the Aussie has been steadily appreciating versus the USD. But, stock market plunges in 2008 and 2010 dropped it from the channel it’s been following since 1999. When the stock market recovered, the AUDUSD regained the channel — always following the same impulse channel slope on the upside, and the same corrective channel slope on corrections. Over the past few days, we’ve bumped up against the upper boundary of the current corrective channel. Recall that this trend line correctly forecast the past two steepest plunges: the July 240-pt selloff and the late October 130-pt drop. So, when we approach the channel line for a third time, we should all pay close attention. As always, the question is “are we there yet?” There are two harmonic patterns I’ve been watching, a large Gartley (purple) and a smaller Crab (red) pattern (updated 10:30 am). The .786 of the Gartley is up ahead at 1.0519 and the 1.618 of the Crab is very close by at 1.0534. So, even though we’re pushing that channel line, I think it’s possible AUDUSD has a little more juice in it before the reversal we’ve been waiting for. 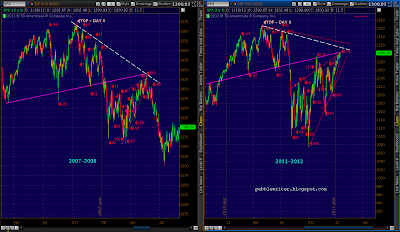 If so, I’d expect SPX isn’t quite done yet, either. Thanks, everyone, for your comments. And, thanks to the 150+ who've emailed already. Please check the Thursday morning post for more on this. BTW, did I somehow give the impression that I've turned bullish? I sure hope not. I think this sucker is going to go down so fast it'll make our heads spin. 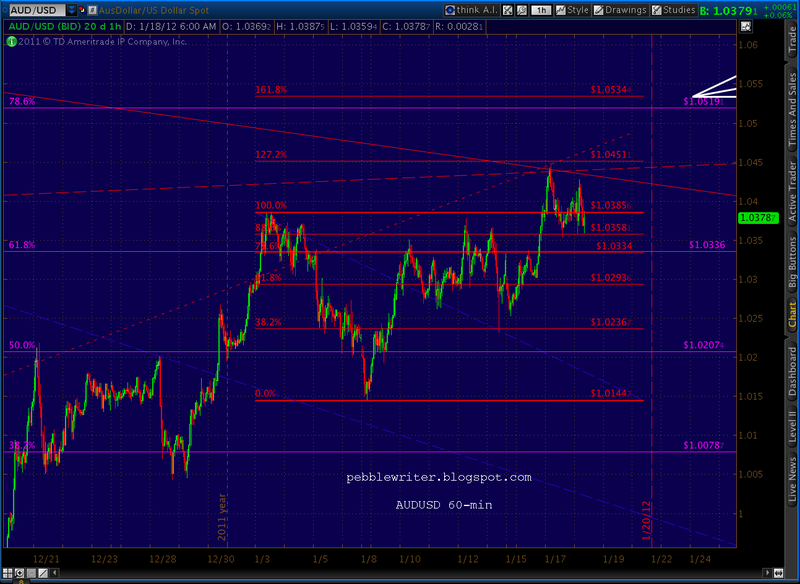 But, we could tack on another 15 points to 1329 or so (and get past OPEX) first. Check out Thursday's post for some numbers. Pebble as usual thanks for the updates. I sent you an email with my opinions on the pay-to-access site. Wanted to bounce some of the harmonics I have been watching by you and get your opinion. 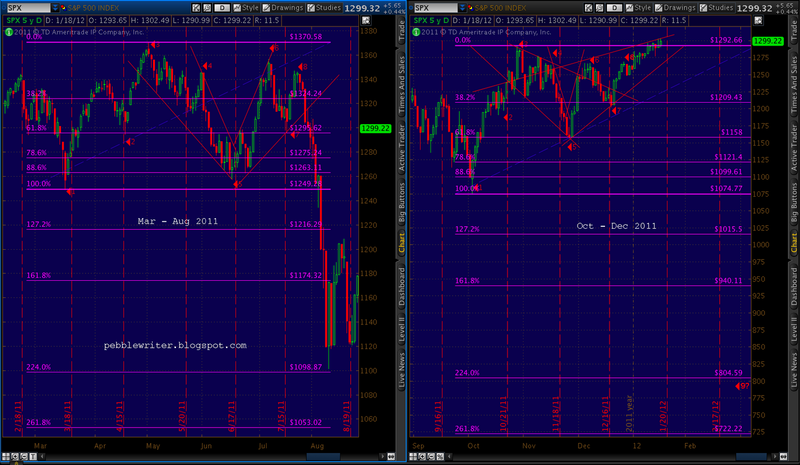 It looks like SPX may be working on completing a bat pattern at 1336. Using X as the May high and A as the October low, you can make a case that B was hit on 10/12 just below the 50 retracement and C @ the 38.2 was hit on the next day 10/13. 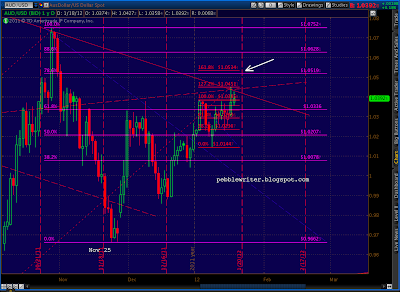 The target for D in this case is 1336. 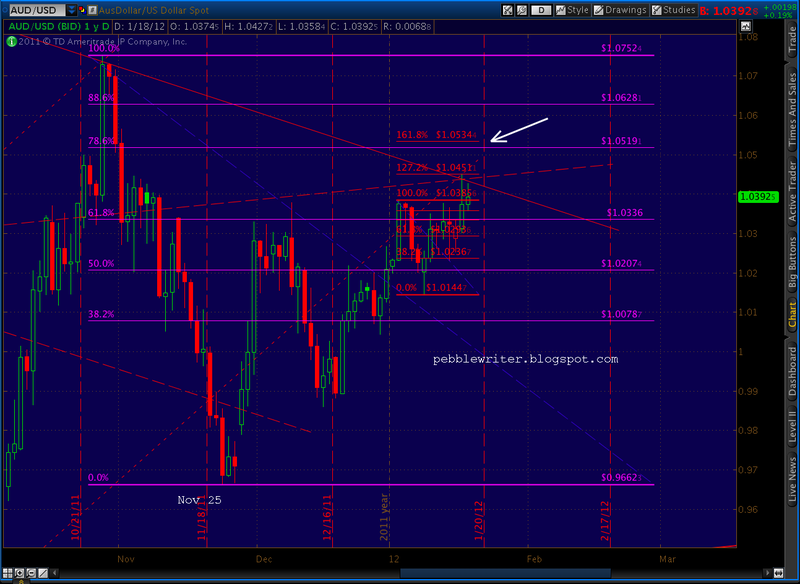 1336 also is almost smack on the descending trend line from the 2007 high. I also have been watching the harmonics on the RSI. It seems as though the daily RSI is in the last leg of a butterfly. 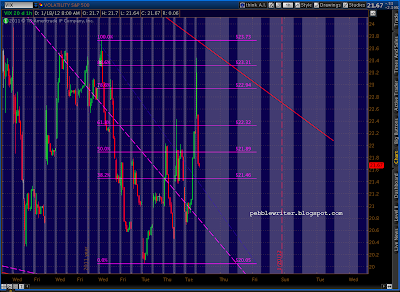 X in this case is the 10/28/11 peak and A is the 11/23/11 low. 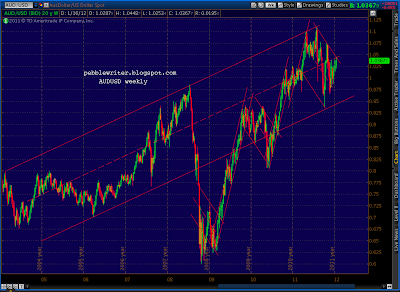 Additionally, the RSI weekly looks to be finishing a gartley. 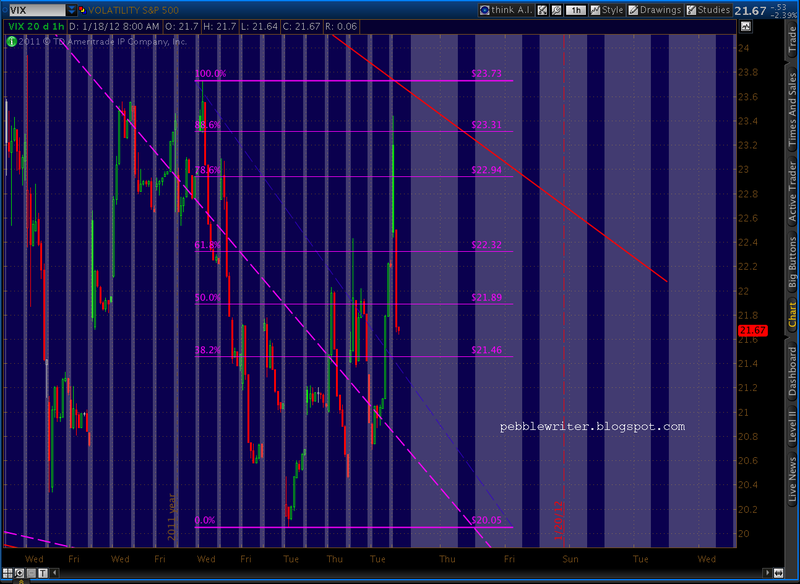 X in this case is the 2/14/11 peak and A is the 8/8/11 low. In my opinion, a final push to 1336 would complete the bat pattern, and finalize the harmonics in the daily and weekly RSI. 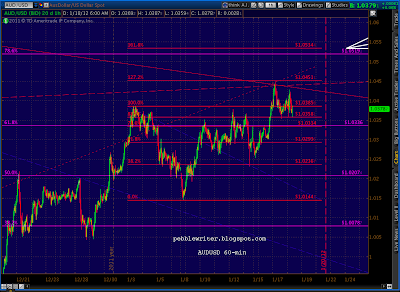 It also would correspond well with the last push up the harmonics are expecting in the AUD/USD (as you noted above). PW, I'm in the same boat as gardens. I am not a pro trader or anything, just a regular guy trying to learn. Reading your tribute to the Novosels and your musings about timing re: WTC and retirement is what made me decide to check in most days. As an ex New Yorker from the 70's exodus, I gravitate to others who lived there for whatever reason… I can't blame you if you want to make a buck, who doesn't. If you go that route, I wish you the best! 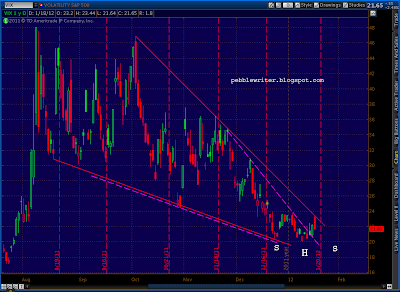 PW, the action today smells like a bull trap IMHO. Look at that volumeless melt up at the end, S&P; made new high but VIX refused to budge. Financials were lagging a bit. 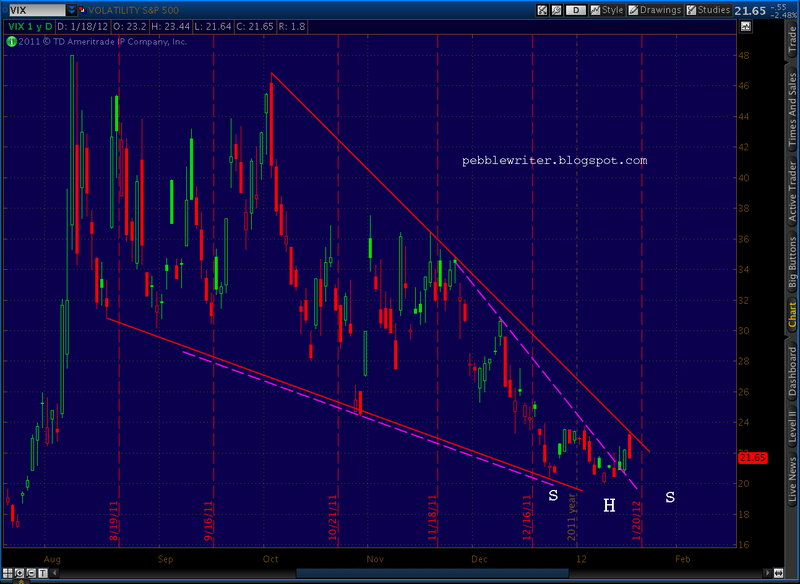 Do you still see the VIX to 28-29 in the short term? It kind of fallen back inside the wedge, didn't it? As for the fee, I respect your expertise greatly and read your blog several times a day to check for updates. I guess I don't mind paying a fee (depending on how much and how frequent is the payment, monthly/yearly), but the fee thing is a turn off for new readers. Also by charging a fee, I feel that you will have more pressure/stress in your charting/analysis due to the fact that the readers pay to read your writing, not free. Just my 2 cents. Thanks for your update. 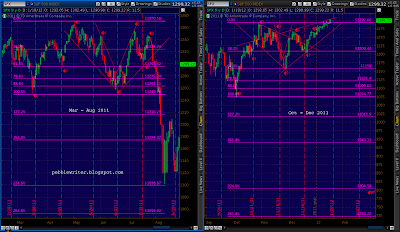 Many weeks back, many people were talking about this fractal, maybe that is why it couldn't play out exactly. Now that nearly no one talks about it, maybe it will be back in sync again?